It encourages writers of all stripes to make a month-long commitment to creativity. Do you suffer from “Someday I’ll write that book…” syndrome? 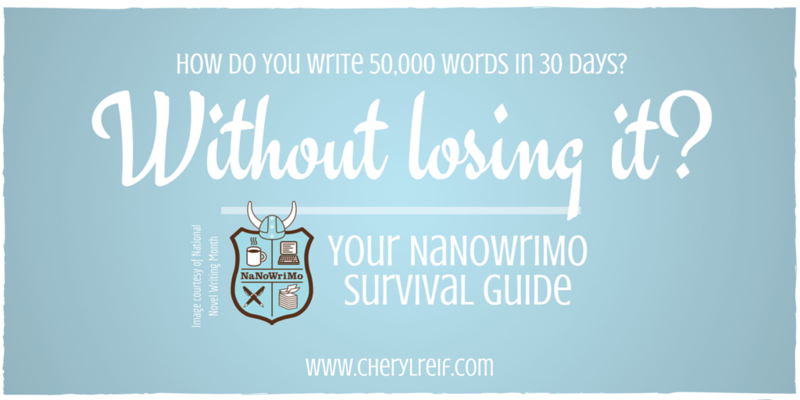 NaNoWriMo helps you conquer it! It helps writers establish a writing practice. Have you been meaning to write more, or write more regularly? Nothing like making a public commitment to help you make the change! With its ambitious word count goals, it pushes writers to accomplish more than they might otherwise. You know that feeling you get when you reach a seemingly impossible goal? It’s fantabulous–and it will provide you writing energy and enthusiasm for months to come! It inspires writers with a sense of community. When you aren’t the only one working on a difficult task–writing a novel–that sense of community can often provide that little extra something you need to keep going. It inspires writers with regular pep talks and encouraging emails from published authors. I love the author lineups they’ve put together for previous years–and the diversity of encouragement and advice they’ve offered. It helps writers practice writing without letting that inner critic interfere…an essential skill for any would-be prolific and productive writer. Anyone else fight with perfectionism? NaNoWriMo is the (perfect) antidote! If you’re thinking that all this sounds great, but how the heck could you possibly write 50,000 words in a month without going crazy–well, you’re not alone! It’s not easy. In fact, it’s downright difficult at times…even stressful. You can’t accept the challenge and gain the benefits of NaNoWriMo if you let NaNoWriMo create overwhelming stress in your life. I know this from experience. The years I’ve gone into NaNo pre-stressed and pre-overwhelmed, the experience hasn’t been everything I hoped. Even when I managed to crank out the words, those I wrote during periods of overwhelming anxiety weren’t words I ended up using later. Part A: Start your pre-project preparations by taking an inventory of everything in your environment that has potential to cause you stress when November rolls around. Here’s my list–feel free to share yours in the comments! Make sure everyone takes care of their own clothes! There are also great resources on the NaNoWriMo Prep page, including links to inspirational articles like How to Schedule Time for Writing, by Chris Baty, and The Truth of What It Takes to Be a Writer, by Hugh Howey. And, of course, there’s the “NaNo Prep” thread in the NaNoWriMo forums. What are your top potential stressors–and how can you prepare for them? Maybe you like starting November with a full plot outline in hand; or maybe you prefer to wing it, making discoveries about your characters and story along the way. Either approach works fine! Whether you’re a “plotter” or a “pantster,” though, a little preparation can help you can minimize those stress-inducing blank-page moments–you know, when you’re staring at the page/screen and have absolutely no idea where to start. Consider answering a few questions about your characters, plot, or setting beforehand, such as those listed in 10 Questions to Ask When Beginning a Book. Or–if you prefer to start November with a completely open mind–start collecting resources that will help you keep the words flowing if you do ever feel stuck, such as the post 10 Ways to Spark Creative Connections. Although it’s tempting to sacrifice sleep in order to squeeze in more writing time, this strategy only works short term. Sleep is important for helping our minds make connections–a key element of creativity. For years, scientists thought that the function of sleep was merely to rest the body and mind, but recent research suggests that sleep is essential for both learning and creativity.”–Joanne Cantor PhD in Sleep for Success: Creativity and the Neuroscience of Slumber. “Sleeping on a problem” is a known way to fish for insights. …psychologist Deidre Barrett, PhD, asked her students to imagine a problem they were trying to solve before going to sleep and found that they were able to come up with novel solutions in their dreams. In the study, published in Dreaming (Vol. 3, No. 2), half of the participants reported having dreams that addressed their chosen problems, and a quarter came up with solutions in their dreams.”–from The Science of Creativity, American Psychological Association website. Think of those hours you snooze as fuel for writing time! Research backs it up: happy people are more creative. [Sadness] inhibits new ideas. This may be because when people are sad, they are more wary of making mistakes and exercise more restraint, says study author Karen Gasper, PhD, a social psychology professor at Penn State University.”–from The Science of Creativity, American Psychological Association website. So don’t think you have to suffer for your art–make time for people and activities that feed your soul. Although breakthroughs are possible when you force yourself to write, distracting your “logical brain” is another known method for encouraging insight and creative solutions. Make time between writing sessions to nap, take a walk, wander outdoors, meditate, swim, shower–anything that distracts your analytical mind and allows ideas to percolate in the background. On October 19, I'm launching a free 5-part email course to help you prepare for your next big fiction writing project. Sign up here to be notified when it's ready to go! with us. Please keep uss informed like this. Thanks for sharing. 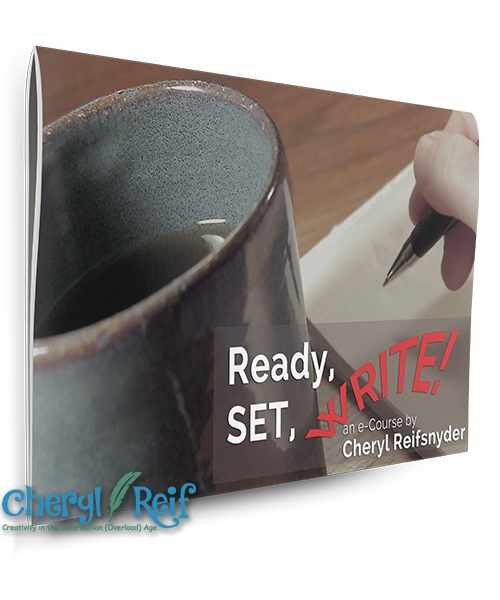 Enter your email address (and name, if you don't mind) to sign up for the free Ready, Set, WRITE! email course.